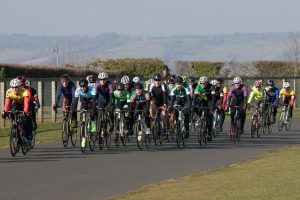 Bristol RC came to the final round of the Odd Down Winter Series en masse in an attempt to jump their overall contender John Russell above series leader Charlie Revell (Team Tor 2000 Kalas) to grab the overall victory. Russell needed a top two finish in the absence of Revell to take the win, but could not have come much closer as he finished third from a break of eight riders behind Samuel Beckett (Cardiff JIF) and Deacon Cutterham (Bikestrong-KTM). 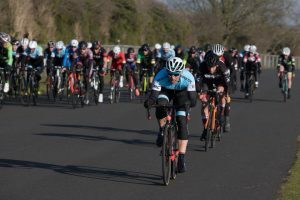 Dan Martin (University of Bath) has been active all series and made the first move, but with a swarm of blue and white at the front of the bunch, making an escape was to prove challenging. Adam Robertson (BPF Coaching) took advantage of a rare occasion where the Bristol riders were not present to clip off the front with Cutterham, Jared Linden and University of Bristol’s Jamie Atkins. But, one lap later the move had been brought back and replaced by Cutterham’s Bikestrong-KTM teammate Paul Jones along with Matthew Beckett(Cardiff JIF), Liam Chaill (Somer Valley CC) and Bristol RC’s Christopher Hill. The presence of a Bristol RC rider made this move an attractive prospect for other would-be escapees, and so Alex Mellor (Bristol South CC) and Rob Borek (Forever Pedalling) jumped across. The pace was hot at the front, and so it wasn’t long before the break started to fall apart under pressure from Jones with Martin and University of Bath riding hard on the front of the bunch behind. Jones was left to persevere up front on his own, but as the bunch held within five seconds of the solo leader the complexion of the race changed definitively. As his teammate Hill was caught, Russell leaped across the small gap to Jones out front, with Linden and Jone’s teammate Cutterham in his wheel. The quartet immediately set to work, and time was running out for the bunch to respond to the threat. Joe Peatson (Ely RC) tried to bridge solo but it was a lap later as Russell’s ever-loyal teammate Andrew Edwards (Bristol RC) went to join his leader that Samuel Beckett hitched a ride over to the front of the race. They were followed by third overall Rob Hardyman (Forever Pedalling) and Jake Hollins who were across to the escape group in the nick of time before the gap started to stretch definitively out of reach. Bristol RC had played the race perfectly up into this final phase, and as the break entered the final lap with a 10 second advantage it looked perfectly set up for Russell to take the series. But there was nothing he could do in the final sprint to overhaul Beckett, who beat Cutterham by half a bike length to take the win. 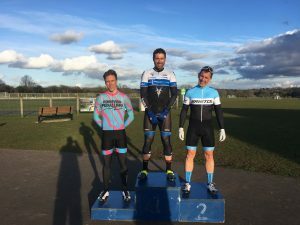 Hardyman sealed third overall as he followed Russell across the line in 4th and despite finishing last of the escapees, Linden moved from 8th to 5th overall having ridden aggressively all series. Edwards also benefitted from making the winning move, moving from 13th up to 11th in the final standings. Bristol RC can take further consolation in their near miss as Tom Sharp took the bunch sprint by a huge margin to mark his return to form. 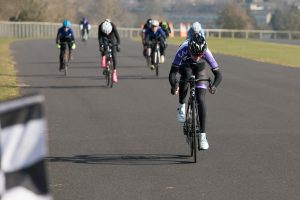 The main fight for series places in the women’s series was the battle for the podium spaces between Rebekah Nash (Univsersity of Bristol) and Molly Hodges (Avid Sport) behind confirmed series winner Lauren Johnston (Avid Sport). Like Russell in the men’s race, Hodges could count on plentiful team support with not only Johnston but also four other Avid Sport teammates to try and finish ahead of Nash for only the second time this winter. It was not long before Nash was put on the back foot, with a sharp attack from Avid Sport’s Kate Baker. 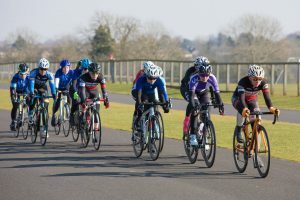 Nash immediately got to work managing the gap and once Katie Scott (Hargroves-Ridley-Montezumas), Clare Crozier (Black Sheep CC) and Lucy Gadd (Liv CC-Halo Cycles) began to share the workload Baker called off her attack and was soon back in the group. Scott was no putting in a large share of the work on the front to reel in the 4th cat group who had been up the road from the start but were brought back after 20 minutes of racing. And as the race started to enter its final phase, it was Johnston who was now looking to put the pressure on Nash as the University of Bristol rider decided that the best way to keep the moves in check and the group together was to keep the pace high at the front herself. However, when she dropped off the front and the pace softened, Baker again took her chance to spring clear with three laps to go. She was joined by her former teammate Miriam Whitehurst (Radeon-Cycology) as the field looked at one another to respond to the threat. Scott showed her form from the cyclocross racing this winter to take responsibility to bring the pair back and as the race entered the final lap things were all back together and Nash now took to the front. However, disaster struck on the final lap as Nash struck a pedal at the front of the group and came down taking Scott with her. Most of the bunch hesitated, but there was no waiting around for Gadd who immediately had a gap to the others as the final few corners went by. She held this gap all the way to the line to take her third win from three races this series. 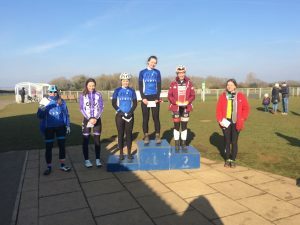 Jess Morrish (North Devon Wheelers) marked her first race of the series with a huge sprint to make up lots of ground and surpass Crozier who marked an excellently ridden race with second. Hodges could only manage seventh place in the confusion at the finish, with Nash recovering from her crash to cross the line in 13th and hold on to second overall thanks to her teammate Charlotte Mallin Martin (University of Bristol) who managed to pip Hodges at the line and deny her the points that would have drawn her level with Nash. Gadd’s win moves her up to 7th overall and Stephie Prince also climbed the standings on the final day into 9th and 10th respectively. 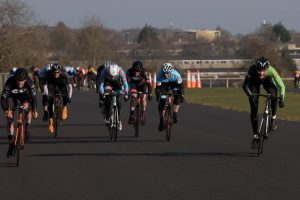 Christopher Wright (Army Cycling Union) put in a big late attack last week to take the win in the 4th cat race, and he looked to repeat the trick again this week, putting in a big move as the race entered the final few laps. He wasn’t having it all his own way second time around however, as Mark Raven went to cover his move and then David Guy (Bristol South CC) set about bringing the bunch back in touch with the lone leader. Wright still had the lead in the final lap, but as the bunch rounded the final bend his lead was down to a mere handful of metres. Indeed, Wright did well to hang on to fifth as he was overhauled by Seb Bernaert (Bristol RC) who just pipped Guy by half a wheel. Simon Bishop made sure there was still a Army Cycling Union rider in the top three following the front two home with David Kinnair (EvoVelo Karbona) the last rider to pass Wright. Avid Sport wrapped up the team classification for the overall series by a healthy margin from Bristol RC. These have been the two biggest representatives in the women’s and men’s series respectively and have consistently been at the very front of the racing.